The proposed expansion of the Trans Mountain pipeline (also known as the Kinder Morgan pipeline) is a controversial issue in British Columbia. This information page provides a brief background and history of the Trans Mountain pipeline and links to the Vancouver Observer's latest news coverage and commentary on this controversial project. The existing Trans Mountain pipeline is owned by the Houston, Texas-based energy company Kinder Morgan and it runs 1,150 km. and transporting conventional crude and diluted oil sands bitumen from Edmonton, Alberta to the Westbridge Marine Terminal in Burnaby, BC. The oil is stored at the Westbridge Terminal and then pumped onto oil tankers that transport the oil to refineries in other markets outside of Canada. The pipeline has operated since 1953. 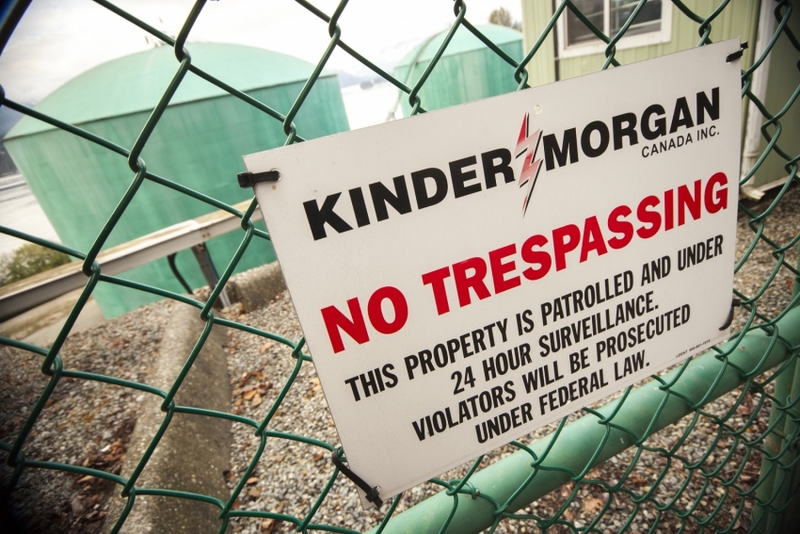 Kinder Morgan, the fourth largest energy company in North America, purchased the Trans Mountain pipeline in 2005 and now the pipeline is referred interchangeably as the Trans Mountain or Kinder Morgan pipeline. Kinder Morgan is currently proposing to twin the pipeline with an additional 994 km. of new pipe. According to Kinder Morgan, this pipeline expansion would increase the amount of oil transported from Edmonton to the Burnaby Westbridge Terminal from the current 300,000 barrels per day to 890,000 barrels per day. In July, 2007 a road crew's excavator accidentally dug down and pierced the pipeline, causing a massive rupture that spilled more than 250,000 litres of oil into a Burnaby neighbourhood and 70,000 litres into nearby Burrard Inlet. The incident received international media attention as the oil shot into the air coating houses, cars, lawns and roads in a thick, black carpet of oily crude. An estimated 250 residents had to be evacuated and the clean up cost $15 million. The 2007 pipeline rupture remains fresh in the minds of many residents in the City of Burnaby, including the long-serving Mayor of Burnaby, Derek Corrigan, who is a very vocal opponent of the pipeline and is enacting the jurisdictional means at his disposal to stop the expansion of the Trans Mountain pipeline. The fear amongst Burnaby residents is that the expanded pipeline means more risk of larger pipeline ruptures occurring in the future. As it stands right now, the 300,000 barrels of oil pumped from Northern Alberta via the Trans Mountain pipeline requires approximately two oil tankers a week to ship the stored oil from the Westbridge Marine Terminal to foreign markets. The planned tripling of the transport capacity of the Trans Mountain pipeline would mean that tanker traffic through the City of Vancouver's waterfront via Burrard Inlet would increase to as high as ten oil tankers a week. This is a major concern for environmental groups, the local tourism industry, First Nations and other communities that rely on British Columbia's west coast waters, as increased oil tanker traffic means more risk of an oil spill. Any expansion in the ability to transport Alberta's oil sands to foreign markets, allows for the expansion of the extraction efforts by oil sands companies operating in Northern Alberta. The expansion of the oil sands has been shown to have major negative impacts on local communities in the Northern Alberta region, especially amongst local First Nations communities that rely on the natural resources -- fresh fish and fresh water -- to subsist. More globally, there are major ongoing concerns about the greenhouse gas emissions produced in the extraction process and downstream when the oil sands is processed and made into products like gasoline. According to most studies, the greenhouse gas emissions from a barrel of tar sands oil are an estimated 3 to 4 times as intensive compared to those of a conventional barrel of oil. The Alberta oil sands are the fastest growing source of greeenhouse gas emissions and many are concerned that the Trans Mountain pipeline expansion locks a major increase in greenhouse gas emissions for the long term if it is to proceed. You can click here and go to an index of all the Vancouver Observer stories on the Trans Mountain Pipeline.